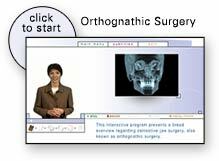 Orthognathic surgery is needed when jaws don’t meet correctly and/or teeth don’t seem to fit with jaws. Teeth are straightened with orthodontics, and corrective jaw surgery repositions misaligned jaws. This not only improves facial appearance but also ensures that teeth meet correctly and function properly. If you are a candidate for Corrective Jaw Surgery, Dr. Chemello, Dr. Gauthier and Dr. Colby will work closely with your dentist and orthodontist during your treatment. The actual surgery can move your teeth and jaws into a new position that results in a more attractive, functional and healthy dental-facial relationship.